Toronto: Random House Canada, c2009. The thought of [him] nursing secret, unfulfilled ambitions saddened Mma Ramotswe, as did the thought of people wanting something very much indeed and not getting the thing they yearned for. When we dismiss or deny the hopes of others, she thought, we forget that they, like us, have only one chance in this life. "I will put the kettle on," said Mma Makutsi briskly. "We have had a very big shock this morning, and tea will help us get over it. That is what tea does. That is well known." The second book I read is the fifth in McCall Smith's "Scotland Street" series. This series began as a newspaper serial and thus consists of short chapters following a number of different characters. This collection takes us to Australia with Matthew and Elspeth, on their honeymoon, in which Matthew gets swept out to sea by a rogue wave and is presumed missing, leaving us hanging for several chapters until we finally learn of his fate! We also re-encounter my favourite character, the eternally 6 yr old Bertie, who achieves his dream of joining the Boy Scouts and coincidentally runs across Ian Rankin, making another cameo appearance. It's a very funny scene. We follow Domenica and Angus (with dog Cyril in tow) and get to the bottom of the Spode teacup theft which has been building since the previous book in the series -- and also find out that new neighbour Antonia is dealing in an unusual and illicit substance. There are many musings in this book about various social and/or moral conundrums, a hallmark of McCall Smith's style which I appreciate, and there is also a sharper sense of humour, more satiric, than is used in the Botswana series. 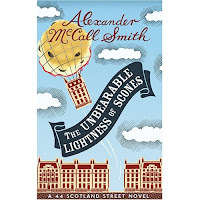 It highlights Edinburgh and McCall Smith's familiarity with his home in a reliably amusing manner, and the format is perfect for reading bits between other books. As ever, I recommend Alexander McCall Smith in all his many permutations. I love McCall Smith's books set in Edinburgh, and can't wait for more of Bertie and co. I haven't started on the Botswana series yet, but am sure I'll enjoy it when I do. I just bought my first AMS book - Sunday Philosophy Club - do you read that series? Tara - yes, I really enjoy the Isabel Dalhousie stories as well. There will be a new one in that series this fall, apparently. Yay! I love the Scotland Street series, Melanie! I'm about halfway through the latest Isabel Dalhousie, and it's just lovely.